There are fewer rituals that my family performs that I dread more than Christmas Eve dinner. It should be re-named "Torture Me Night." No, it's not the Christmas carols that my kids and I sing to far away family and friends in operatic voices over the phone- I like that part. It's not the anticipation of seeing the kids wake up and see what "Santa" brought them the next day. It's not even the exhaustion I feel every December 24th at about 1:00 in the morning, having wrapped all the gifts when the kids finally have fallen asleep. Nope. It's CHRISTMAS EVE DINNER. What could be so dreadful about a Christmas Eve dinner? 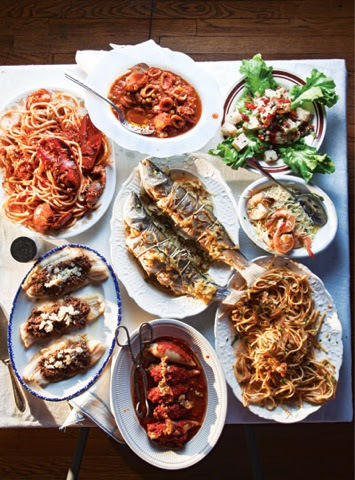 Well, my medagon friends, a typical Italian dinner on December 24th involves a long-standing and for me, unappealling traditional meal- SEAFOOD. It's the one night a year when I, myself, wear the title of "Medagon," given to me by my parents. I don't eat seafood. Non mi piace. It never has appealed to me, with the exception of fish- tilapia, haddock, tile fish, tuna, and my favorite: flounder. So, the meal to which I was subjected for every year of my life until I was 33 and moved far away enough from my family to not go back on Christmas Eve, just Christmas Day, is an array of "Seven Fish(es)." I used to reef to this as the Parade of Fishes as a kid, for the way they just kept coming out of the kitchen. To qualify for the "Feast," It does not have to be actual fish- any seafood will do. The offending fare can include (but is not limited to) the following: -flounder or another kind of fish (in my family it was breaded flounder, the only kind I would eat as a kid, to make me feel included and loved) -crabmeat -shrimp -mussels -clams -lobster -calamari (I think this appeared on the table once or twice at my grandparents house where we would spend Christmas Eve until 1986 when they moved to Florida) -tuna (in the marinara sauce) and the one dish that my mom opted out of making and left it to my dad and grandmother: bacala (as in dried codfish, not "Bobby."). It gets soaked a long time before preparation to remove the heavy salt taste and is served with a red sauce. You'd have to rip out my tastebuds to get it to taste good to me. The seafood was always served with linguini (I prefer capellini, but I took what I could get) with the tuna or crab sauce and I would get a "medagon special," a dish of linguini with melted butter and Locatelli cheese. Nope, I wouldn't even eat the sauce if it had fish in it. Now some people ask why the number seven? It's debatable- the number of days to create the universe, some say, others say the number is 13- one for each apostle plus Jesus (keep me out of THOSE houses) and my mom's version- any odd number under seven. So when I got was on my own, I made that number become ONE. The next few years I started a new tradition of flying in the face of tradition and, allegedly, Canon Law (this proved untrue- I could find nothing that says you cannot eat meat on Christmas Eve) and going out to an Italian restaurant on Christmas Eve and ordering anything but fish. For me, that means veal. On the way home from dinner the kids and I would sing to anyone who would answer the phone while we drove, and then swear to them that we were not drunk and neither were the children. The kids sang in celebration of Christmas. I sang in celebration of not having to eat fish. I second the motion.My feelings exactly. Lol..I just do all kinds of shrimp. Flounder and crabmeat..lobster...crab legs...can't do the crazy seafood. ..I know the feeling. ..didn't eat any of it when I was a kid.